Online sports betting brand BetStars is headed to Pennsylvania, thanks to a partnership between The Stars Group (TSG) and Mount Airy Casino Resort. TSG is also the company behind Internet poker giant PokerStars, which is lined up to be the face of Mt. Airy’s online casino and poker site. Although BetStars is better known overseas, it did debut a U.S. sportsbook in September 2018 in New Jersey, more than two years after PokerStars first launched in the state. And while Mount Airy hasn’t revealed much about its physical sportsbook plans, we can safely predict what the online site and mobile app will have in store by scouting out BetStars’ existing Garden State operation. Offering a one-time bonus in the form of a welcome package is a tried-and-true method of enticing users to sign up a sportsbook account. It’s also a great way for players to make some extra cash at the expense of the house. In the past, BetStars has favored offering new players up to $500 in free bets. To get the full value, patrons must first sign up an account and make a deposit. Next, they’ll place a bet of up to $50, which the site will match. Thereafter, for every $150 wagered, players will receive an additional $50 in free bets, up to $450. So, in other words, in order to procure the entire $500 in free bets, players will have to place $1,350 in wagers. Look for a similar promo in PA when BetStars launches. 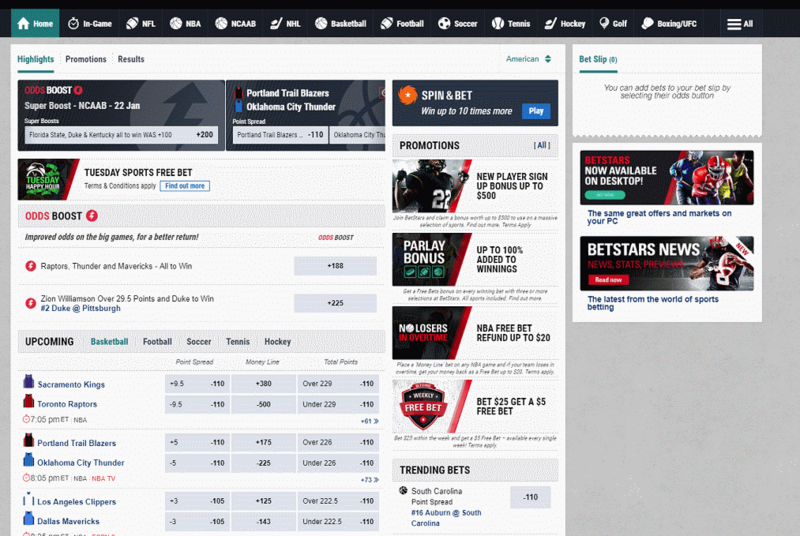 What advantages will BetStars’ sportsbook have? 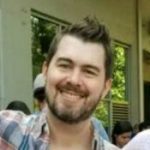 Unique and numerous promos: BetStars’ parent company has deep pockets, and will definitely want to make its presence felt in PA through big-budget marketing campaigns and promotions. 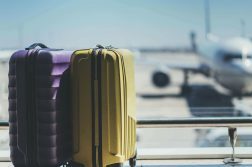 Anticipate taking advantage of an enticing welcome bonus package along with rotating promo offers. All-in-one integration: TSG plans to offer not just sports betting, but also its famous poker product, along with an online casino to boot. All of these options will be available inside a single app and utilize a unified wallet, eliminating the need for multiple player accounts. Polished betting interface: TSG designers draw on more than a decade of experience in developing gambling software, something on full display with BetStars’ masterfully designed interface. The UI lays out all of the different betting markets and lines on offer in a sleek and easily readable fashion. Rewards across all products: Players will earn loyalty rewards for real-money play across all of TSG’s products (BetStars, PokerStars and PokerStars Casino). These rewards are tailored for each player, and can be used to open chests which contain goodies like StarsCoin (TSG’s virtual currency), free plays and more. Alternative formats: Players looking for something beyond the traditional better fare will be enticed by formats exclusive to BetStars, including Spin & Bet, which allows players to gamble it up for a chance to win 10x their baseline payout. In reality, we know very little about Mount Airy’s plans for an on-site sportsbook. We do know that it will have one though, as each licensee is required to operate a physical book in order to put its product online. While the property still hasn’t applied for its $10 million sports betting license yet, we expect it to happen any day now. The venue made its intentions clear in August, when it released a statement revealing its wide-ranging online gambling partnership with The Stars Group. In addition, during a Pennsylvania Gaming Control Board (PGCB) meeting, it revealed that it would be constructing a sportsbook at its forthcoming satellite casino, which it purchased for over $21 million. Mount Airy’s main property features a 6,500 square foot gaming floor, stocked with 1,800 slots, 70 table games, and a nine-table poker room. It’s yet unclear as to where the sportsbook will fit into the space. In terms of branding, Mount Airy could go the route of The Meadowlands racetrack in New Jersey, which has christened its live sportsbook with the name of its software partner, FanDuel. BetStars has already built some brand recognition in the Garden State, so the property could potentially dub its book “BetStars by Mount Airy,” or something to that effect. While we know little about Mount Airy’s physical sportsbook, we have a very clear picture of what the BetStars online and mobile products will look like. The BetStars app was originally spun off from its DFS product, StarsDraft, in 2015. Four months after the Supreme Court struck down the law limiting full-scale sports betting to Nevada, it was licensed and launched in New Jersey. While the app is polished and robust, BetStars has, up to now, been dominated by DraftKings and FanDuel in the Garden State. The two DFS behemoths account for the lion share of profits generated there. The BetStars NJ interface. Expect a similar look on BetStars PA.
Mount Airy hasn’t yet shelled out for its sports betting license, but The Stars Group has been proactive, receiving state licensing for its products at the tail end of 2018. BetStars already has plenty of experience in the international market, but was not able to launch online and mobile versions of its New Jersey product simultaneously. iOS and Android apps came first, with desktop play only being offered in early 2019. With the lessons it’s learned in NJ, it’s likely that BetStars will be better prepared this time around, and be ready to launch all three platforms when it gets the green light from PA regulators. BetStars’ online and mobile app has its roots in the daily fantasy sports industry. In August 2015, just over a year after PokerStars had been acquired by Amaya, the company purchased DFS provider Victiv, which it soon rebranded and relaunched as StarsDraft. In December of that year, it decided to spin off its DFS venture into an outright sports betting product, launching a new site called BetStars in international markets where sports betting was legal. Once the Supreme Court paved the way for sports wagering in the U.S., the site turned to its existing New Jersey online casino partner, Resorts Casino, for a sports wagering license. BetStars went live in September 2018 in the state, at first only on mobile apps, and adding a desktop platform a short time later. Due to TSG’s ambition and aggression in the U.S., it was always assumed that BetStars would seek partners in other states which legalize sports betting, especially Pennsylvania. The only mystery was trying to determine which casino it would partner within the Commonwealth. Some thought that Mohegan Sun was an ideal candidate, due to its strong links with its NJ partner, Resorts. In the end, it was Mount Airy Resort that landed the deal. The Stars Group announced in August that it had inked an agreement with the Mount Pocono casino to offer online poker, online casino games and sports betting. Mount Airy applied for its online slots, table games, and poker permit in July for the cost of $10 million, and received conditional approval the following month. While it has yet to formally apply for a sportsbook license (for an additional $10 million fee), it will likely happen sooner rather than later. Apart from announcing it would offer online sports betting through BetStars, it stated in a PGCB meeting that it would be building a physical sportsbook at its soon-to-be-built satellite casino in Newcastle. Mount Airy ranks on the low side of PA casinos in terms of revenue, so having the backing of a big-name partner like The Stars Group for both online gambling and sports betting is a major plus. That said, BetStars as a sports wagering brand isn’t yet very well known outside of the U.S. and New Jersey. In the Garden State, DFS companies DraftKings and FanDuel dominate the online scene, with BetStars accounting for only a small percentage of overall revenue. PokerStars, on the other hand, is extremely well known and will be launching in the Commonwealth sometime later this year. 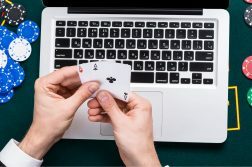 If PA poker sites are allowed to share player pools with other online gambling states, the website could once again become the king of online poker in the U.S.
That traffic could in turn have a positive effect on the company’s other gambling verticals, as TSG player wallets are unified across poker, casino, and sports. Patrons tired of playing cards could very well be intrigued by the beckoning sports betting and casino icons conspicuously placed on the app and website. If the industry plays out like it has in NJ so far, though, BetStars will need to up its game if it wants to outmaneuver the DFS juggernauts, which have already shot out to a big lead over the competition.